When the thunder starts rumbling before a summer storm in Ward County, most folks head indoors and shut the windows to wait out the weather. Contrary to common sense, Chad Gravesen and Derek Peterson make a dash for their airplane. as a flight instructor, charter pilot and commercial airline pilot. Mountrail, Williams and McKenzie counties. When the thunder starts rumbling before a summer storm in Ward County, most folks head indoors and shut the windows to wait out the weather. Contrary to common sense, Chad Gravesen and Derek Peterson make a dash for their airplane. More specifically, for the twin engine Piper Seneca tied down at the Kenmare Municipal Airport, or another of the seven similar planes parked in Minot, Williston, Stanley, Watford City and Bowman leased by the North Dakota Atmospheric Resource Board (ARB) for the 2010 ND Cloud Modification Project (NDCMP). Chad, a 2008 graduate of Kenmare High School, and Derek, a 2006 KHS graduate, are two of the intern pilots working for the NDCMP this summer. Both attend school at the University of North Dakota, where they’re majoring in commercial aviation. Chad, who will start his junior year in the program this fall, is adding a minor in meteorology. Derek plans to graduate in December. The NDCMP accepted only nine interns for the 2010. “A lot of the time, they don’t even have any North Dakota people [as interns], and this year there are two Kenmare boys,” said Derek. “It’s a good way to build hours and flight time for my future career,” said Chad. The NDCMP continues through the end of August, but Chad will go back to UND earlier in the month. “I’m hoping to instruct at UND for the school itself,” he said, adding he will attend a hiring and interview workshop for those positions during the first week of August. Derek, the son of Curtis and Susie Peterson, didn’t come from a flying family like Chad’s. Instead, Derek attributed his initial interest in airplanes to his grandfather, the late Eldon Cook of Kenmare. He paused and grinned. “But what really got me hooked was watching Brekhuses spray,” he said, referring to Great Plains Aero operated by Palmer and Karen Brekhus and their son Julius Brekhus. 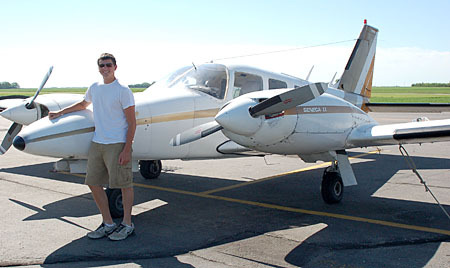 Derek started flying during his first year at Williston State College, taking private lessons at age 18 in a single engine Piper Warrior and earning his license by age 19. 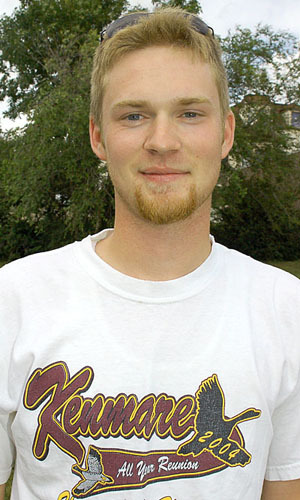 He completed his general courses at Williston, then transferred to UND starting his sophomore year. He admitted that working as a spray pilot interested him following graduation, given his own interest in farming. “The airlines aren’t really hiring right now, because of the economy,” he said, adding he would prefer to work as a corporate or charter pilot anyway because of the scheduling and the time away from home. Then he smiled again. “And I’m working on getting my own plane,” he said. Even as they talk about their futures as pilots, Chad and Derek stay focused on the present, on call for the NDCMP essentially 24 hours a day from June 1 until the end of August. Chad joked about the schedule. “A typical work day? I wake up and do nothing,” he said. If thunderstorms appear imminent for the day, the pilots preflight the plane and prepare the chemicals. Then they wait at the airport for further instructions. The silver iodide acts as a substitute for ice crystals in the storm cloud, and allows super-cooled liquid water in the cloud to freeze. According to the ND ARB, seeding effects can be seen any time from almost immediately to within 30 minutes, depending on conditions and the seeding method. He and Shepherd couldn’t actually find anywhere suitable to seed in that storm. “We had to land, then the storm blew up and moved out of our district,” he said. He and the pilot finally decided to land in order to clear the ice. “Then, we returned to the storm and dropped about 60 flares into it,” he said. The NDCMP operates in two districts in the state, including District 1 in Slope and Bowman counties and District II in Ward, Mountrail, Williams and McKenzie counties. Counties pay about two-thirds of the expenses for the project, with cost-share funds provided by the State for the balance. Cost of the 2010 NDCMP was expected to be 12.5 cents per acre. From time to time, results of seeding are documented and studied to evaluate the effectiveness of the program. Hail data collected during the 1970s from the North Dakota Pilot Project showed less hail on seed days than on no-seed days, and lower crop-hail insured losses on seed days than on no-seed days. In fact, a 1997 study of crop-hail insurance data estimated a 45 percent reduction of crop-hail damage in the seeded counties. Analysis of rainfall data recorded during the 1970s suggested an increase of approximately one inch of precipitation during the growing season, an increase of 5 to 10 percent over the average. In terms of economic benefits, a 2009 study by North Dakota State University agricultural economists suggested a $12 million impact from the NDCMP considering a 5 percent rainfall increase and a $19.7 million impact considering a 10 percent rainfall increase. Additional benefits from a reduction in hail damage were not calculated in the study, but were presumed to be substantial. Chad is already considering a return to the NDCMP next summer. “This is one of the best jobs I can think of in North Dakota,” he said.